When it comes to the vehicle that helps you tackle your commute through Marlton, Mt Laurel, and Cherry Hill, it’s important to own a car that takes a step beyond where other vehicles settle. If this sounds a lot like what you’ve been looking for in your automobile, the redesigned 2018 Honda Accord is here to answer your prayers. Let’s dive into the performance, technology, and safety innovations with this impressive sedan by checking out this 2018 Honda Accord review created by Burns Honda. Before long, you’ll be turning heads along your path like never before. Your vehicle should act as a full-service concierge that provides you with your most beloved technologies at a moment’s notice. Luckily, the 2018 Honda Accord comes equipped with an array of high-end entertainment features that’ll put you on the fast track to your favorite tunes, radio shows, or anything else. Tucked into the ergonomic center console of this sedan is a standard 7-inch touchscreen that quickly connects you to all the applications you need to fully relax on your ride home from work. Some of these gadgets include Bluetooth®, a USB audio interface, and Pandora®. For even more versatility, consider opting for the available 8-inch Display Audio system that features standard Apple CarPlay™ and Android Auto™. With these capabilities, you’ll be able to access your library of custom music at any time. 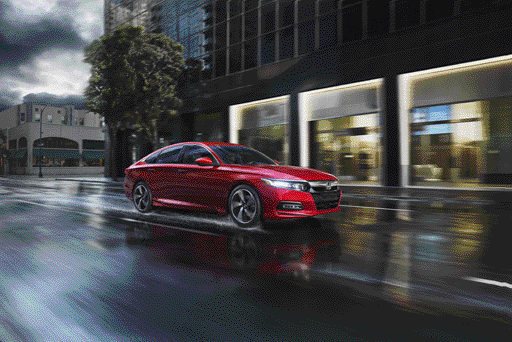 On top of that, the Honda Accord ups the ante on convenience with its optional wireless charging system. So if you find yourself in a situation where your smartphone may run out of power, all you have to do is place your device in the charging port and continue down the road with peace of mind. With your loved ones inside your vehicle, it’s essential to know that you’ll be warned when dangerous situations are headed your way. That’s why the 2018 Honda Accord presents an optional Head-Up Display that keeps you engaged with critical information about your ride with an eye-level projection onto the windshield. Thanks to this intuitive tool, you’ll be able to check on your navigation directions, speed, incoming calls, and more with a quick glance. Once this system detects a potential accident, it’ll offer visual or audible alerts so you can take the necessary corrective actions and keep your family and friends out of harm’s way. After being stuck in gridlock, all you want to do is press the pedal to the metal and set sail on the open road. And beneath the sporty hood of the 2018 Honda Accord is a 1.5-liter turbo engine that surges forward with 192 horsepower and 192 lb-ft of torque. By pairing all that force with the standard continuously variable transmission with Sport Mode, you’ll effortless soar down your route. Simply hop behind the wheel and you’ll be dominating the highway in no time. Test Drive Your 2018 Honda Accord Today! At Burns Honda, we want you to enjoy every minute of your drives near Marlton, Mt Laurel, and Cherry Hill with a powerful automobile. And when you opt for the 2018 Honda Accord, nothing will stand between you and a heart-pounding road trip or commute to work. Don’t wait around to learn more about what this sedan has to offer. Instead, stop by our showroom or schedule your test drive today!